The sarcophagus shows the representation of a battle between Amazons and armed warriors, maybe Greeks, and armed men, perhaps Greek warriors, which can be referred to the episode of the Amazons’ invasion of the Attica region. The main characters, Theseus, Antiope and Prito, cannot be easily identified as they are depicted regardless of their individual features; the scene therefore results in an array of battling groups. The Amazons are usually depicted wearing a short chiton, the diplois (a short cloak) and tall boots fitted with straps, while they brandish their typical weapons: the pelta (the Amazons’ half-moon shaped shield) or the double axe (Labrys) . The rich variety of the helmets they wear is also peculiar; the Amazons’ hair is often collected in a knot behind their head. The Greek warriors, instead, wear their typical short exomis (a kind of tunic used by light infantry), tall boots and round helmets; they also hold short swords, with the exception of the central figures who wear Corinthian helmets and an armour, as well as the other Greeks that proceed ahead of them, who mostly wear shoes with laces. 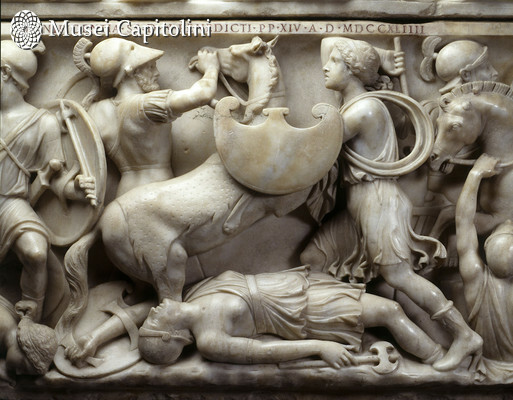 On the front of the sarcophagus, three relevant groups are depicted: the first one in the middle shows an Amazon fallen dead from his horse with other Amazons around her, one of whom is depicted trying to take revenge by attacking the Greek warrior who has killed her companion. On the contrary, in the second scene on the left, another riding Amazon is represented at a gallop; she is killing a Greek warrior with her axe, while the bodies of two dead Amazons lie on the ground. In the last group, on the right, a Greek is seen from the back; he has fallen from the horse with the reins still in his hand, while an Amazon is about to attack him. On either side, figures of Victories are represented clad in a long chiton, with their hair gathered in a knotted tuft, while a Victory of the left holds a trophy. On the left side of the sarcophagus, there is a group formed by a warrior who grabs an Amazon by her hair with his left hand, while holding a sword in his right hand. At the corners of the lid, heads of young men with long and wild hair, perhaps barbarians, are represented; on the front, a scene depicts a group of captured Amazons with loose hair. The work can be considered as a good production of the second century BC, it was found in 1744 among other sculptures in the Roman “Tenuta di Salone”, an estate owned by the Chapter of Santa Maria Maggiore, on the Via Collatina. Presented to the Capitoline Museums by Pope Benedict XIV in the same year, the findings also included some remains of human bones and jewelry.